Greg Glover brings extensive performance experience from the musical theater. He has performed recently in roles at the Chattanooga Theatre Centre, Signal Mountain Playhouse and Leap of Faith productions. Recent credits include leads in The Music Man, Beauty and the Beast, and 1776. Greg also served as Drum Major of University of Tennessee Pride of the Southland Marching Band, and currently serves as the media voice for the band during football season. 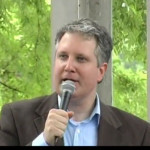 This is a showcase of performances of vocalist Greg Glover with Sweet Georgia Sound. If you’d like Greg and Sweet Georgia Sound to perform for your event, contact us. 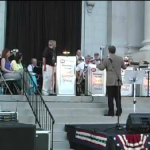 For this Veterans Day weekend here’s Greg Glover and Sweet Georgia Sound performing God Bless The USA from the June 2013 big band day at The Chattanooga Market. Another video from our friend Jim Good. 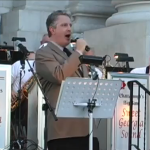 From The Hamilton County Courthouse Centennial Celebration on June 29,2013 Greg sings Jump, Jive, and Wail. JJ Jackson on alto saxophone and Stephen Bearden with a trumpet solo so good that both Greg and Mike were hypnotized and almost missed bringing the vocal back in. 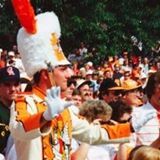 As many of you know Greg Glover is not only a former UT drum major he is also the current voice of “The University of Tennessee Priiiiiiide of the Southland Marching Band”. In honor of the beginning of college football season and the UT opener today here is Sweet Georgia Sound performing Rocky Top under the direction of Greg at the Hamilton County Courthouse Centennial 6/29/2013. 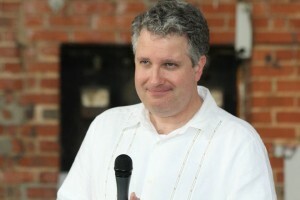 In this video from The Hamilton County Courthouse Centennial Celebration on June 29,2013 Greg Glover takes us down to llama land where a one-man band will toot his flute for you.